Doha Bank, one of the largest private commercial banks in Qatar, has opened free online registrations for 2017 Al Dana Green Run, which will take place on Saturday,9 December at Khalifa Stadium in Aspire Zone. 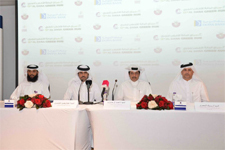 The 13th edition of the annual run, organized by Doha Bank and supported by Qatar Olympic Committee, Qatar’s Ministry of Culture and Sports, Qatar Sports for all Federation (QSFA), Traffic Department, and Aspire Logistics, will coincide with the commencement of this year’s Qatar National Day celebrations. On top of promoting environmental awareness and a healthy lifestyle, the 3-km run, billed as one of the biggest and most widely attended community events in the country, will pay homage to Qatar and support the recently launched Tamim Al Majd campaign by spreading messages of unity and solidarity among Doha’s community. Al Dana Green Run is open to people of all age groups and fitness levels offering 10 running categories, including professional athletes, heavyweights, families, and special needs among others. Winners from each category will be awarded cash prizes, while plenty of surprises will be on offer for audience members, who will be treated to free entertainment all day long. The popular family-friendly event will also feature a dedicated fun zone area at the venue to entertain visitors of all ages with a range of activities, such as kids’ concerts and dance parties, face painting, inflatables bouncy houses with giant slides, football and basketball competitions, as well as coloring crafts workshops to name a few. The 13th edition of the Dana Green Run is organized by Doha Bank and supported by Aspire Logistics, Qatar Olympic Committee, Qatar Athletics Federation, Ministry of Interior, Traffic Department, Qatar Red Crescent, Ministry of Culture and Sports, and Qatar Sports for all Federation (QSFA). Moreover, we are pleased to extend our thanks and appreciations to H.E the Minister and all the officials in the ministry for their appreciated contribution, in compliance with His Highness’s instructions on cooperation between the government’s institutions and the private sector. Al Dosari also said:” I believe that it is our duty to support this unique event as Qatar is on its way to becoming a global sports destination. More importantly, it is an honor and privilege for us to pay homage to our country and the visionary leadership of His Highness the Emir Sheikh Tamim Bin Hamad Al Thani”.